I've been revamping my base and, I know it is still early access but, will hatches ever depressurize? 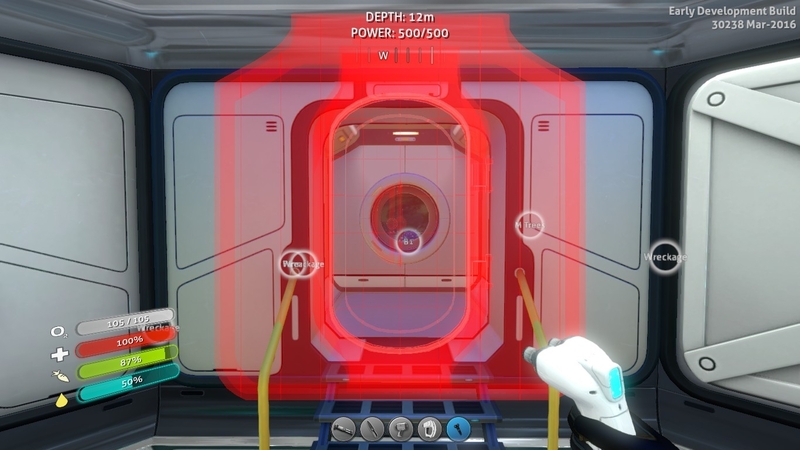 Will water start filling the area if you open a hatch that is not on the bottom of something, like the life pod or Cyclops? I think it would make the bulkhead more important as you would need to make a proper airlock as a big base would fill with a lot of water very fast. I give my bases proper airlock because of this fact but will it ever be a thing in the game. For simplicity's sake I don't think this'll ever be a thing. Could be cool, though. You *can* build your hatch on the bottom of I-, T- and X- connectors IIRC. But yeah I don't think they'll implement flooding. Your base can flood already it will take damage from impact, negative strength, etc, and it gains water until you fix it. So all they should need to and is an animation entering and exiting and during it the hatch will behave like its damaged, but faster than other parts, and now you have a depressurizing hatch. If you want to add a "pressurization chamber" for realism's sake, you could add in a bulkhead door near the hatch. I remember having this conversation a while back. I believe it's one of those acceptable breaks from reality where they prioritize gameplay over realism. Realistically, going in and out of a pressurization chamber would be tedious at best, and game-breaking at worst. There's some realism that people enjoy, and some they don't. Same as you don't have to wait for your SeaMoth or PRAWN to empty or fill, they simply skip that waiting period where nothing happens anyway, so they don't break your stride. You also don't have to sit down on a bench to don and doff your SCUBA gear every time you go out or in. Ever notice your fins magically appear on your feet when you go outside? My big hangup: Think about getting in and out of large aquariums. I've always thought they should have made the hatches go on the top only, because those side-mounted aquarium hatches break my willing suspension of disbelief more than the outer habitat hatches do. This would make sense, since we already have some gravity manipulating stuff ingame. Also, a regular hatch would be impossible to open/close (depends, if it opens in- or outside) without "The Dude" beeing a Superman. Especially 900m under the surface. 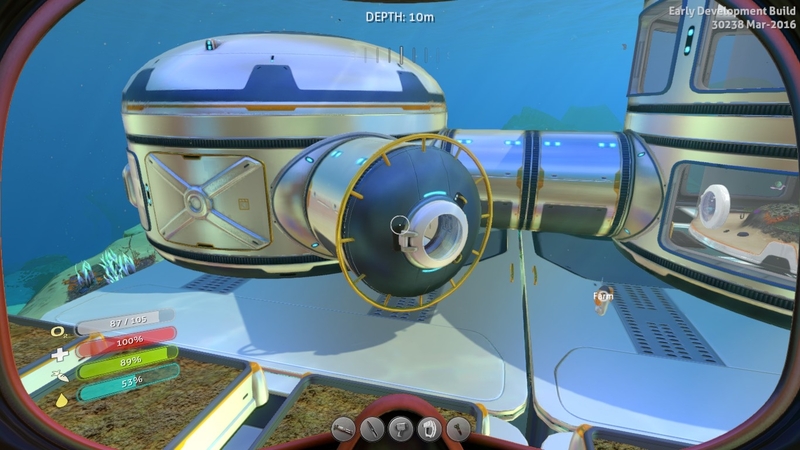 Btw, have you noticed, that when the upper section of the seabase gets damaged, lower rooms often stay perfectly dry? i remember a bit ago seeing a dev discussion about this a bit ago as well as animation for entering the hatch but I'm not sure what happened. 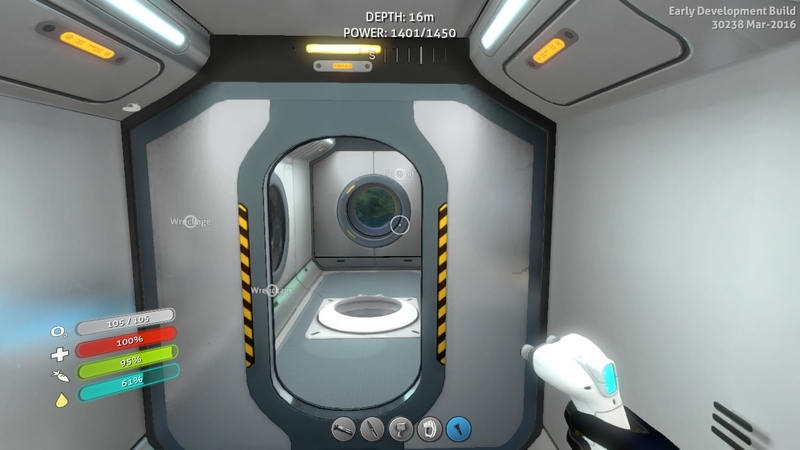 to make things more realistic the bulkhead to the airlock can be auto closing with the player having to wait for the water to fill the airlock before entering from outside, and waiting inside the airlock for it to fill with water before leaving it to go outside with the exception that it is in the floor or bottom of the corridor. Bulkheads are glitched atm and stop working 30 minutes after you build them, you then have to deconstruct them. Nevermind realistic base hatches... when are we going to get the ability to turn off the lights in our seabases while keeping the primary power on?